Every student enrolled in the Denair Unified School District qualifies for three free meals each day starting this school year. Nearly half the roughly 1,300 students at the district’s four campuses meet the Community Eligibility Provision (CEP), allowing the district to offer free breakfast, lunch and an after-school snack to every student. A district qualifies for the program if more than 40% of families in its attendance area are enrolled in Medi-Cal. Students also qualify if they are certified as homeless, runaway, migrant, foster or enrolled in a federally funded Head Start program. Denair’s participation and the federal and state reimbursements will save the district an estimated $5,000 this school year in food subsidies, said Chief Business Officer Linda Covello. 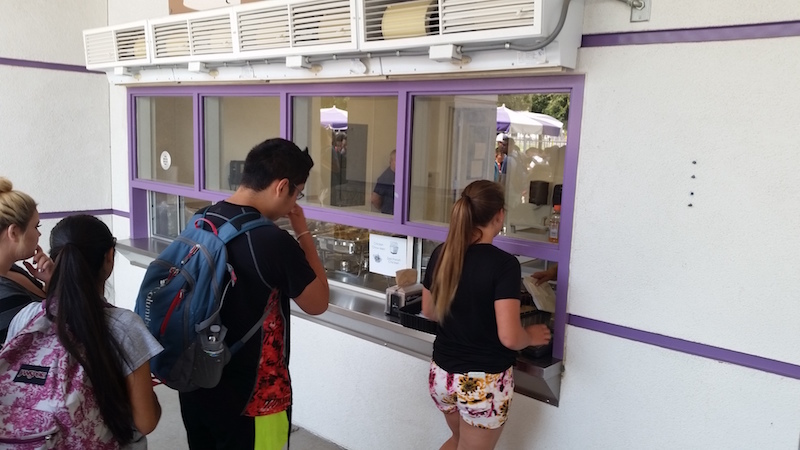 School is barely two weeks ago and Denair High students already know where they want to be at lunch. The Culinary Coyote. Within minutes of the bell sounding, the long lines start forming in three queues. The attraction? Hand-made burritos. Burgers, hot dogs and potato wedges. Chinese entrees. Savory pastas and pizza. An assortment of fresh fruit and vegetables. And all for just $2.10 per meal. Talk about a bargain. The Culinary Coyote is the brainchild of food services director Billy Reid. It has been three years in the making, time spent creating the right menus and funding formula to pay for it all. The results – measured not just in numbers of students served, but in satisfaction and smiles – are easy to see. Reid’s vision was to expand the options from which students had to choose and improve the quality while remaining sensitive to price. More than half of the children in the Denair Unified School District qualify for free or reduced price meals. The Hot Rod Café, which features burgers, hot dogs, popcorn chicken and biscuits, potato wedges and barbecue chicken sandwiches. The Taste of Italy, which last week had two kinds of pizzas (pepperoni and cheese), baked ziti and buttery garlic bread sticks. Other choices include spaghetti and meatballs or lasagna. The Taste of the Far East, where students can decide between chow mein, rice, stir fry veggies or Szechuan chicken. There also are fortune cookies, of course. A Build Your Own Burrito Bar, a popular destination in the first weeks. Students select a meat (chicken or beef) or beans, then can add tomatoes, guacamole, sour cream, salsa, peppers and olives as they wish.